If there is anything everyone can agree on, it is that steakhouses are expensive. As a college student, it is very rare to have the luxury of a delicious steak dinner in Madison at a price that is affordable. However, Tornado Steakhouse makes that possible daily with their ‘late night’ menu! Commonly referred to as Tornado Room, Tornado Steakhouse has a renowned reputation across Madison for its award-winning cuisine and cool atmosphere. From 10pm to 1am, you can actually eat extremely affordable yet unbelievable food at arguably the best restaurant in downtown Madison. The menu features items like Salmon sandwiches for a price of just nine dollars to a Sirloin Steak which costs just fourteen dollars. Fine dine at a reasonable price! At an earlier hour, ordering steak at Tornado Room can cost up to a whopping fifty-five dollars, so waiting until ten for this meal is definitely worth it! Badgers can order themselves a Shrimp Cocktail, Steak Sandwich, Smoked Muenster Burger, Bacon Bleu Cheese Burger, and salad all while barely hitting the price of that same fifty-five dollar steak. Whether it’s date night or you just want to treat yourself after a long week of classes, Tornado Steakhouse provides unbelievable food without your wallet taking a big hit. 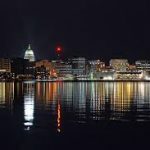 Tornado Steakhouse is located right near the capitol, a perfect walking distance from campus, and is a great affordable way to spend your night eating in Madison.